Summer cooking often calls for strong spicing, and the spices of Goa are among some of the strongest and most assertive. If Peter Mayle got even a sniff of this wonderful shrimp and vegetables dish he would be banging on his wooden bowl in his writing cell, demanding for a change from all that bland Provençal fare. Luckily, we've managed to elude our Provençal jailers, so we can eat Goan spices shrimp and vegetables whenever we want. It is easy to forget that it has been over 400 years since the Portuguese set up shop in Goa. That is plenty of time to establish a new cuisine. After all, the Italians have only been eating tomatoes for 200 years, and we think of tomato sauce as Italian. Anyone who has ever swallowed a bowl of raita after downing a bit too much heavily seasoned chicken vindaloo would be hard pressed to realize that he or she has been the victim of fusion cuisine. 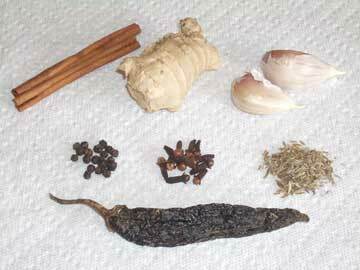 The word "vindaloo" comes from the Portuguese words for wine and garlic. It is not Hindi for a reactor meltdown. Not all Goan spices achieve such critical mass, but they can be assertive. Our basic mix includes cloves, black pepper, cumin seed, cinnamon, hot peppers, ginger and garlic mixed with vinegar and brown sugar. While such mixes are not all that rare in Indian cooking, that is an old fashioned spice mix by European standards. The Portuguese rounded the Horn looking for spices, and they found them. Cut up the chili pod into little patches. Cut up the cinnamon stick into chunks. Put them in a clean coffee grinder and grind them into a coarse mixture. Depending on your coffee grinder this may take several minutes, and you might want to pulse it a bit and make sure that everything is getting ground up. (We use one of those little spinning blade grinders. This may be easier if you have a real gear grinder). Add the pepper corns, cloves and cumin seeds. Blast the mixture in the grinder until it is fine enough for your taste. We usually go for a slightly coarse grind, but you might like it finer. You can save this spice mixture in a jar, so you might want to make a double batch and save some. Just mix up all the spices and you're good to go. You might want to do a little tweaking since these quantities are approximate. We always like to grind our own mix, so we've only done this once when we were in a hurry. Peel the garlic and ginger and grind them together in a food processor. Add the dry spices, the vinegar and the sugar. Peel the shrimp. You can use ordinary shrimp, but we really like the white shrimp that we get at the Safeway. They have much more flavor than the rather bland tiger shrimp we usually find. Mix the shrimp and the spice mixture from the food processor and let it sit for a while. Blanche the vegetables if they need it, and most romano beans or string beans need it. When in doubt, blanche the vegetables and cook them until they are bright green. Heat two tablespoons of olive oil in a pan over medium high heat. 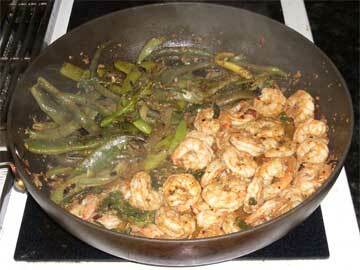 Add the shrimp and cook until the turn pink and curl up. Add the vegetables and stir them in so they are sauteed in the oil and Goan spice mixture.